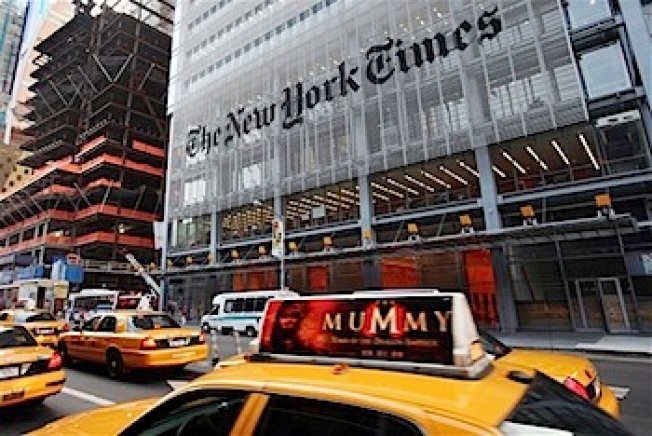 The New York Times hopes to raise funds by possibly selling its shiny new building and leasing it back. The New York Times Co. said Wednesday that fourth-quarter earnings plunged 48 percent and online sales fell for the first time as the recession depressed spending by advertisers. The results still beat analyst estimates, and its shares rose nearly 10 percent. The Times also announced it has retained investment firm Goldman Sachs to help explore a sale of its 17.8 percent stake in New England Sports Ventures, which owns the Boston Red Sox baseball team, Fenway Park, a portion of a cable sports network and other properties. The Times company, which publishes the Times, The Boston Globe, the International Herald Tribune and 16 other daily newspapers, earned $27.6 million, or 19 cents a share, in the October-December period, compared with $53 million, or 37 cents per share, in the same quarter of 2007. Excluding various one-time charges, earnings totaled 36 cents a share, above the 27 cents per share that analysts polled by Thomson Reuters had expected. Its shares rose 55 cents, or 9.8 percent, to $6.15 in morning trading. Revenue totaled $772.1 million in the fourth quarter, slightly above expectations of $767.5 million but 11 percent below the $865.8 million in the year-ago period. Like other newspaper companies, the Times has suffered from plunging ad revenue as the recession exacerbates weaknesses resulting from the migration of readers to the Internet. Last week, Lee Enterprises Inc., publisher of the St. Louis Post-Dispatch and other newspapers, said its fiscal first-quarter earnings tumbled 69 percent. Media General Inc. and Gannett Co. report their results later this week. “The disruptions of the global economy are affecting all businesses and industries, especially companies, such as ours, that generate a significant portion of their revenues from advertising,'' said Janet L. Robinson, the company's chief executive. Robinson said the company has responded by cutting its dividend by 74 percent and agreeing to a $250 million cash infusion from Mexican financier Carlos Slim, which comes at a hefty 14 percent interest rate. In a setback for the Times' digital ambitions, the company reported that Internet revenue decreased 2.9 percent to $92.5 million and online ad sales fell 3.5 percent to $81.9 million. Although online revenue represents only 12 percent of total revenue, an increase from 11 percent at the same point a year earlier, that is where the Times and other newspapers are pinning their hopes for the future. Online advertising has been slowing across the industry after years of rapid growth, and the latest numbers show that even the Internet isn't immune to the weak economy, and advertisers might be spending their smaller budgets on the tried and true. "As people hunker down, they are probably less inclined to try new things,'' said Rick Edmonds, a media business analyst for the journalism think tank Poynter Institute. The current quarter so far doesn't look much brighter. The Times company did see a 3.7 percent gain in circulation revenue to $234 million, largely resulting from higher prices at the Times, the Globe and other papers. Debt stood at $1.1 billion at year's end. The Times has been trying to raise $225 million from its new, 52-story midtown Manhattan headquarters, either by selling the building and leasing it back or borrowing against it. Wednesday's announcement on the hiring of Goldman Sachs confirms the company's interest in selling the Red Sox and related properties. Barclays Capital analyst Hale Holden has valued the Times stake in those properties at $140 million to $166 million. During the quarter, the Times took a charge of $19.2 million, or 7 cents a share, to reflect the declining value of the International Herald Tribune as revenue prospects worsen. The company also took a writedown of $24.1 million, or 10 cents a share, for severance costs related to the closure of a retail and newsstand distribution subsidiary. For the full year, the Times reported a net loss of $57.8 million, or 40 cents a share, compared with net income of $208.7 million, or $1.45 per share, in 2007. Sales fell 7.7 percent to $2.95 billion.